People love SUVs and the trend isn’t slowing down anytime soon. It makes sense that both SUVs and crossover vehicles sales are continuing to skyrocket as these vehicles offer a lot of comfort, style, and practicality. A good number of passengers can fit into each one and there is more space for cargo or hauling important items. Nissan has a great lineup for 2018 of SUVs and crossovers and no matter what you are looking for, you should be able to find it. New this year is the Nissan Kicks. This is little compact crossover offers a breathtakingly low starting price but that doesn’t mean Nissan has skimped on other stuff. There are a host of cool gadgets to make the ride even more fun and some playful customization options so that you can really feel like the Kicks is your own. Starting at around $17,990, the Kicks offers an impressive 31/36 mpg. The Kicks comes equipped with Nissan Intelligent Mobility which offers drivers an incredibly connected drive. Four trim options are available with the Kicks SR starting at 20,290. The Kicks is perfect for the driver who wants a playful crossover with some attitude but not too much sticker shock. The 2018.5 Rogue Sport offers some standard safety updates to make this ride even more appealing and secure. Already a popular option, the half year model update makes the SUV an even more appealing choice for those concerned with safety. Fuel economy comes in at 25/31 for the Rogue Sport and the vehicle seats 5. Three trim levels are available with the S starting at 22,110. The new safety features include automatic emergency braking, blind spot monitoring, and rear cross traffic alert. The Rogue Sport is a reliable vehicle for your day to day needs but can also be a great choice for some weekend adventures. There is a lot of flexible cargo space so you can rest assured you’ll be able to haul everything you need. To top if all off, the Rogue Sport comes with that gorgeous sporty styling. 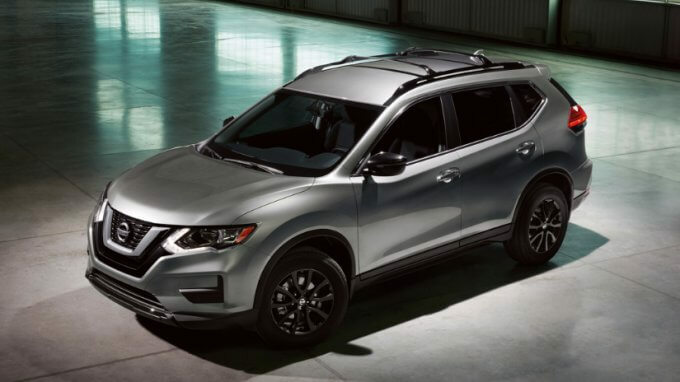 The 2018 Rogue offers a more classic line and appeal. Fuel economy for the Rogue comes in at 26/33 and offers a bit more zip at 170 HP. Five passengers can comfortably sit in the Rogue. The Rogue offers an impressive six trims to choose from, with the S starting at $24,800. The Rogue is the perfect vehicle for anyone who wants more power and aggression in their vehicle. The styling makes a bold statement on the road and the features offer an appreciated level of convenience. The Rogue is the perfect companion for adventure with impressive storage space. Technology upgrades create a safe and smooth drive. The Rogue handles easily and makes for a dyanmic drive. The 2018 Murano offers a more unique styling on the road. Coming in at 21/28 mpg with an impressive 260 horsepower, the Murano is bold and stunning. The premium interior makes any ride in the Murano a pleasure and Nissan’s Intelligent Mobility ensures safety. The Murano starts at $30,800 and there are five trims available. No other vehicle on the road has the gasp-inducing styling of the Murano combined with the dynamic and smooth handling which make it an excellent choice for this class. The 2018 Pathfinder is a great choice for the driver looking for a vehicle that can seat even more passengers. With a fuel economy of 20/27, the Pathfinder can comfortably carry seven passengers. Sometimes a more rugged design is appealing on a SUV, and vehicles don’t come more rugged than the Pathfinder. Advanced technologies are also available on the Pathfinder including Nissan’s Intelligent Mobility. The outer rugged appearance of the Pathfinder shouldn’t fool anyone, though. The inside remains luxurious with advanced technology to offer a fun ride. The Pathfinder comes in five trims and is one of the most confident drives you can find on the market. For the driver ready for anything, the obvious choice is the Nissan Armada. Designed to look more bold and rugged than anything else on the road, the Armada is also technologically advanced with stunning craftsmanship. The driver feels in command in the Armada without sacrificing any sense of refinement. There’s a lot of flexibility in the space in the Armada, too. The 2018 Armada comes in four trims. It’s a perfect vehicle for any weather which makes it the perfect vehicle for travel and adventure. Equipped with Nissan’s Intelligent Mobility, it keeps pace and outshines its competitors in technological advancement. There are a lot of choices when it comes to the purchasing a SUV or crossover vehicle. One thing is clear, though, Nissan offers the best variety and value for the dollar. Call us today to learn more or come in for a test drive.